Today we released Frank the guillemot back to the wild. Frank was found near the Fairy Rink in Pleinmont covered in oil on January 15th. After a period in an intensive care unit, a number of bathes to remove the oil and ten days on our recovery pool he had an identification ring fitted and passed as fit to release. Just after midday he was caught, boxed and transported just below Castle Cornet slipway. GSPCA Manager Steve Byrne drove Frank to be released and on what was a calm sea let him out. Just over two weeks ago you may remember 'Frank' an oiled sea bird arrived at the GSPCA. After a period in an intensive care unit, a number of bathes to remove the oil and treatment he has been recovering well. Today with his feather condition recovering he had his first dip out on the pool at the GSPCA, which despite the cold he seemed to thoroughly enjoy. With all of the rough weather the first oiled sea bird arrived at the GSPCA yesterday. Last year tens of thousands of sea birds were oiled and killed due to the sustained bad weather. Thankfully a number of the birds last winter were rescued and successfully rehabilitated and released back to the wild thanks to the team at the GSPCA. Frank as the guillemot has been named was found near the Fairy Rink in Pleinmont. He has survived his first night and is currently in an intensive care unit and although quite weak the team are hopeful. 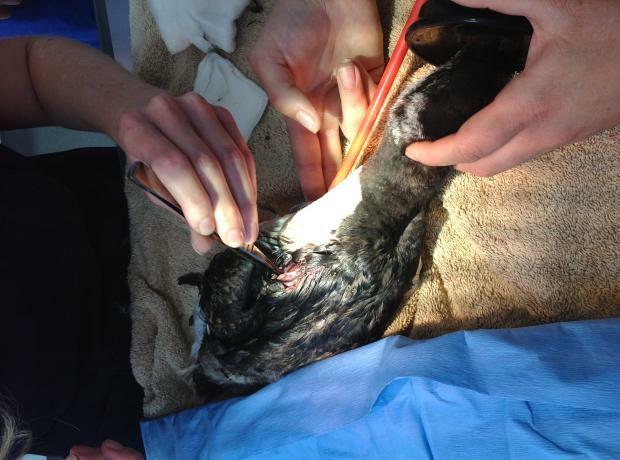 Yesterday afternoon the GSPCA were called to an injured guillemot at Petit Bot. When GSPCA Ambulance Collection Officer Geoff George arrived he was faced with a very distressed and badly injured bird. The guillemot had been caught with a floating fishing lure which had 3 sets of 3 hooks embedded in the back of the bird. The lure had to be cut off and stitched which took place yesterday at Isabelle Vets. The bird was then transported to the Shelter where he has been named Stitch and was placed in an intensive care unit over night. With all the recent sad news of the seabirds that have died around the Bailiwick recently the GSPCA are pleased to report that today 4 guillemots were successfully released back to the wild. Alan (found at Vazon), Rachael (found at L'Eree), Chewy (found at Chouet) and Dave (found at Halfway) after 6 weeks of rehabilitation and care at the GSPCA were released below the fortification of Castle Cornet in St Peter Port. 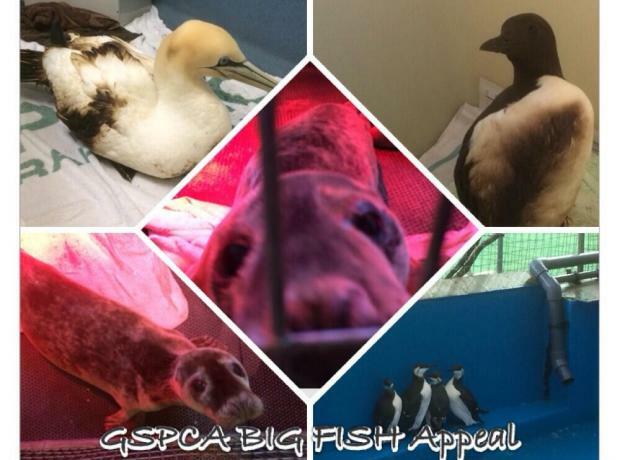 At the GSPCA we have had the busiest start to a year with seals and seabirds than the team can remember. Currently we have 14 guillemots, 1 gannet and 2 seal pups at the Animal Shelter. As you can imagine they are eating a healthy amount of fish and we really need your support. From sandeels to sprats, herring and mackerel each animal is eating large numbers to help with their recuperation. You can donate online through our Just Giving Page, by calling 01481 257261, by post or by popping into the Shelter in St Andrews. With rough weather the GSPCA often finds itself rescuing and caring for oiled birds. The reason we and other coastal animal charities see this increase is that crude oil that has settled on the sea bed gets stirred up and floats to the surface where the birds sadly get coated and then find it difficult to fly, preen, hunt and care for themselves. We closely monitor the locations of where the birds are found and tidal movements in case they aren't isolated incidents. We have had 7 oiled birds in the last week but sadly a Razorbill and 2 Guillemots were to weak to save.